Are you a local PTA Officer or Member and need to brag about something great your PTA has done! Click the link below, fill out the form and let us know about it - it's not bragging if it's fulfilling the mission of the PTA and helping the students of Plano ISD! One of the PISD Council of PTAs Primary missions is to support local PISD Campus PTA/PTSAs. If you are a local PTA Officer or PTA Member and are in need of guidance, or looking for answers, the PISD Council of PTAs should be your first stop. 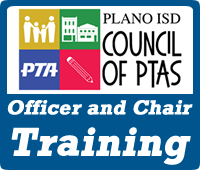 If you can't find what you're looking for on the PISD Council of PTAs Calendar, in Council News and Events, or in the Local PTA links provided through the main navigation (or subnavigation that will display either to the left or at the bottom of this page depending on viewing device), you can always reach out to the Council Board Members directly.